In April, 29th, 1961 a doctor of the 6th Soviet Antarctic expedition Leonid Rogozov aged 27 felt pain in a right lower belly and fever. The next day brought only exasperation. 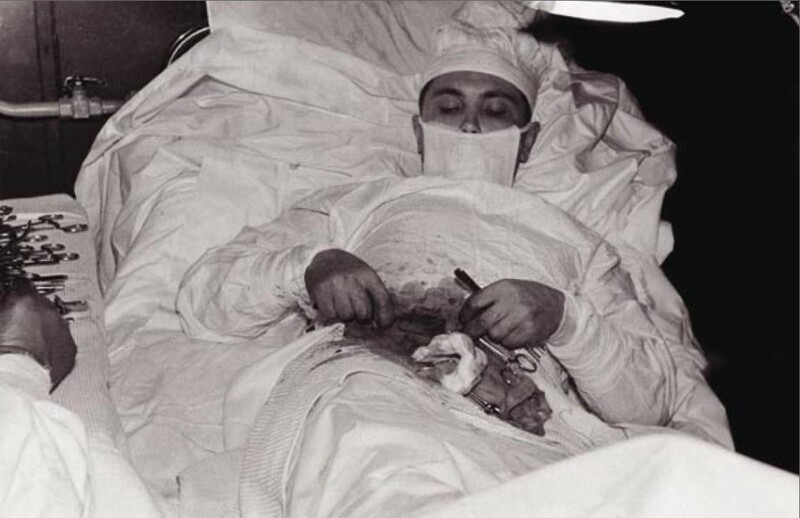 Having no chance to call a plane and being the only doctor at the station “Novolazarevskaya”, at night, in April, 30th the surgeon made an appendix removal operation on himself using local anesthesia. He was assisted by an engineer and the station’s meteorologist. In 1959 Leonid Rogozov graduated from the Institute and was immediately accepted to the surgery clinical residency. 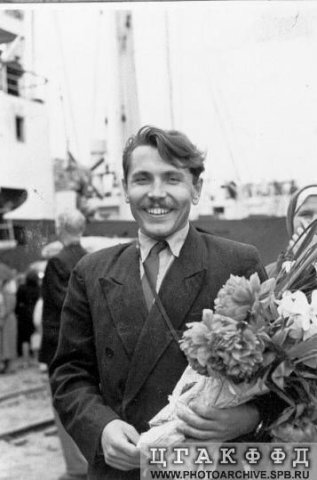 However, his studies at the residency were broken off for some time due to Leonid’s trip to Antarctica in September, 1960 as a doctor of the 6th Soviet Antarctic expedition to Novolazarevskaya station. During this expedition there happened an event that made a 27-year old surgeon world-famous. 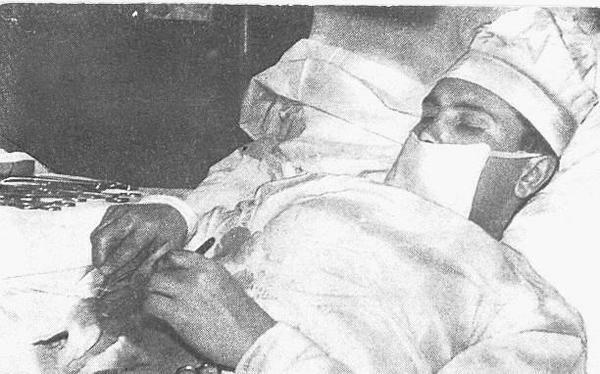 In the 4th month of the wintering, in April, 29th, 1961, Leonid showed disturbing symptoms: weakness, nausea, fever and pain in a right iliac region. The following day his temperature got even higher. Being the only doctor in the expedition consisting of 13 people, Leonid diagnosed himself: acute appendicitis. There were no planes at any of the nearest stations, besides, adverse weather conditions would not allow to fly to Novolazarevskaya anyway. In order to save the sick member of a polar expedition there was needed an urgent operation on site. And the only way out was to operate on himself. At night, on the 30th of April, 1961, the surgeon was being helped by a mechanical engineer and a meteorologist who were giving him the medical instruments and holding a small mirror at his belly. Lying half bent on the left side, the doctor made a local anesthesia with novocaine solution and made a 12cm incision in the right iliac region with a scalpel. Either watching in the mirror or by touch he removed an inflamed appendix and injected antibiotic in the abdominal cavity. In 30 or 40 minutes from the beginning of the operation there developed a faint and giddiness and the surgeon had to make pauses for some rest. Nevertheless, by midnight the operation lasting 1 hour and 45 minutes was over. In five days the temperature normalized, in two days more – the stitches were taken out. In the St. Petersburg Museum of the Arctic and the Antarctic there is an exposure of surgical instruments that Leonid Rogozov applied for this uneasy operation. “In our country an exploit is life itself. … We admire the Soviet doctor Boris Pastukhov, who injected himself with plague vaccine before applying it on the sick people: we envy the courage of the Soviet doctor Leonid Rogozov who made an appendix removal operation on himself in the hard conditions of the Antarctic expedition. The Appendix is attached to the Colon. So, It took Guts. absolute determination, under the most testing of conditions. He was well trained, and the survival instinct kicked in. It takes a lot of courage to operate yourself, and he had no choice. Do it, or die. I love people who have determination and courage like this and who have done the extreme. This is a great post Thank You! Ouch! !Don’t poke that doll Taup! Total respect, that guy had balls, I mean big fat, round, perfect, juicy BALLS. Dude I hope you didn’t swallow your bloody tongue! LOL You are so BAD! You are the last person I would expect… I bet you look sweet and innocent too! Fake! Appendix is on the left, not the right! Wouldn’t want him operating on me! No, appendix is on the right side. On the left , you and everyone else have the sigmoid colon. Go to an anatomy book. I wouldn’t want YOU to operate me. So the next time you’re wondering how you’re ever gonna make it though something that seems impossible, just remember Leonid Rogozov. Only you conservatives could somehow twist this into something bad. It’s unimaginable pain. The simple traction of the colon without anesthesia causes nausea, low blood pressure, and may cause someone to faint from the pain. And the most difficult, he inflicted this pain to himself. Brave guy. I’m attempting to view this in the 9.274 rc of the safari browser and the header looks rather broken up. I think you should take a look. This Doctor well deserves loads of respect! To think my son almost died 3 years ago while having his appendix out in hospital with lots of options, luckily he’s fine now but this story really puts it in perspective. Hey there, my told me about your blog a few days ago. and I absolutely love it. I will be back! Thanks! Um… and where are his surgical gloves if this is legit??? Read the British Medical Journal for the details, it’s absolutely legit. He didn’t use gloves because he preferred it, he says he works mainly by touch. It would probably not have helped him much if he cut himself never mind infection at that point! Thank you for sharing this, I am really apreciated. Please allow us to introduce “Lyric International” as one of the leading manufacturers and exporters of Surgical, Dental & Veterinary Products, Beauty Care Products & Kitchen Tools and all sorts of Scissors backed by an experience of decades in the field where instruments are processed under the supervision of discriminate experts. Uniformity precision and high standard maintained by “Lyric International” through years make our products comparable to world renowned makes and are exported to major global markets likes USA, UK, South America and Various countries of Europe and Africa. We may invite you to visit our web site to have a complete information about our Company and Products. We shall be pleased to established friendly and cordial business relation with you and would welcome your correct enquirers of above products. Awaiting your comments / reply with much interest.